I've never been someone who was comfortable with asking for help. But, it seems that the universe is sending help my way and I am so thankful. It is so strange that when you feel like you are the lowest of low, dear friends and family just know to check in on you. Really, I am overwhelmed by your thoughtful comments of late. I just received a text message from my friend Alfred (from Mississippi) asking if I was okay. How did he know how much just asking would mean to me today? 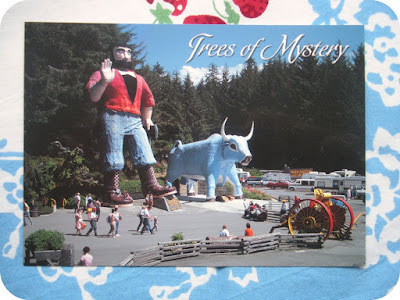 How did my Mommy know that this post card of one of my favorite places, the Trees of Mystery in the California Redwoods, would cheer me up? 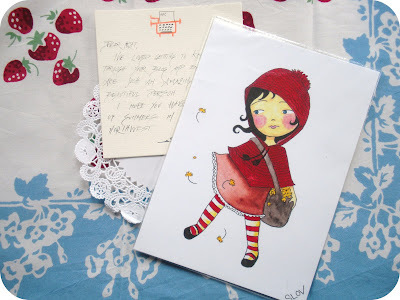 How did my friend Jane know how much an unexpected care package would mean to me? I mean come on, this print screams Kat! She put so much thought into everything she sent and I feel so special. Then there is my new friend Laura. She invited me over, modeled for my shop and took time out of her busy life to spend the morning talking with me. I've found a kindred spirit in my neighborhood, a sure sign that I am about to move. p.s. I hope you always know that I am here for you too. There is nothing like unexpected and perfectly timed acts of love from our friends and family. That postcard your mom sent you is super cute, I bet it made you smile! I'm glad you liked the package, and that you have so many others in your life to lift you up. You certainly deserve it. You're constantly brightening up my day with your posts and kind words. I'm glad you're on the up and up. If there is one thing that you are it is loveable. I am so glad we're friends, I only wish I had met you sooner.